The idea of uniting Africa historically typified the quest for self-assertion and resistance to oppression and discrimination. In the recent past, however, in the context of the increasing global challenges affecting Africa, pan-Africanism evolved into a call for continental socio-economic and political unity. The transformation of the OAU into the AU was prompted by this desire to accelerate the process of integration. While there is a general consensus on the need for African unity, the form this should take remains unclear. Some pan-Africanist debates have often bordered on idealistic expediency with no clear and concrete methodology towards that vision. During a number of previous AU meetings on the subject, discussions often ended up taking political slants, instead of being guided by high-level expertise and sound conception. The consequence often was clouded debates that had limited practical value. An example is the dialectic debates that pitted a group led by the self-styled African ‘king of kings’, the late Libyan leader Muammar Gaddafi, against another led by South Africa under Thabo Mbeki. Gaddafi used Libya’s vast oil resources not only to sell the grandiose idea of the United States of Africa but also to become its driving force. He advocated for the immediateunification of African states into one national and sovereign federation. His main motivation seemed to be his personal desire to become the leader of the union government. It is worth noting, however, that Gaddafi’s enthusiasm for the immediate establishment of a union government helped other African leaders to react to his sometimes-impractical schemes with relatively better alternatives. This is what led observers like Laura Seay, a political scientist at Morehouse College in Atlanta, to suggest that, ‘without Gaddafi, the pan-African movement is dead’. The alternative to Gaddafi’s immediate unification of Africa was the step-by-step approach toward a union government. Often referred to as the gradualist school, this position was advanced by Mbeki and Uganda’s Yoweri Museveni, among others. They preferred the integration of Regional Economic Communities (RECs) into the building blocks of the union government. While this sounds more practical, sceptics argue that RECs have produced limited socio-politicalexperiences of solidarity and that the proponents of this thinking have not demonstrated at what point RECs will ultimately be harmonised into a union government. Overall, if pan-Africanism is a socio-political world view/movement that encourages the solidarity and economic progress of Africans, it remains difficult to reconcile the rhetoric about pan-Africanism with the ambivalence with which African leaders seem to regard building genuine African unity. A basic tenet that is often ignored in pan-Africanism debates is the need to create a union of African people. This means that the pan-Africanist project must focus on African people, rather than African states. The unity of Africans must be rooted in the mobilisation of the African masses across the continent’s artificial borders. The power of African citizenship can be harnessed through the free movement of people, goods and services, obviously within agreed-upon rules. Unfortunately, today the majority of African countries have put in place impediments to uniting African people with expensive visas and strict immigration rules. Sometimes there is genuine fear that the free movement of people, goods and services might result in job losses and increased pressure on housing and infrastructure, among others, in recipient countries. However, if considered rules are put in place, the benefits of free movement can outweigh the losses. Based on the experiences of the East African Community and the Economic Community of West African States, it is apparent that the free movement of people, goods and services has concrete economic benefits. Those opposed to it, however, seem motivated by its perceived threat to national cohesion, something that pan-Africanism seeks to transcend. As the AU commemorates the 50th anniversary of the founding of the OAU, its leadership has to realise the need to develop a sense of direction from within. If pan-Africanism is treated less as an option and more as a necessity, solidarity and cooperation must be promoted at continental level. At present, the AU is a free association of sovereign states working to further members’ shared aims. Other than the vague aim of ‘ever closer union’ in its declaration, the AU has no policy to create either a federation or a union government. With the 50th anniversary celebrations, the AU leadership needs to think critically about how to transcend the perception that the AU is an exclusive enclave of a small elite. 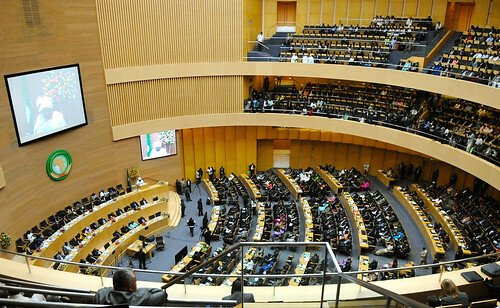 If the AU desires to energise pan-Africanism it needs to develop the capacity for common action at the continental level to tackle the issues and challenges of a shared destiny. In other words, the AU needs to define its authority in a manner that attracts ordinary citizens to its cause. It can do so by transforming its principles, norms and values into practice so that they can have an impact on the lives of African citizens. It can also pursue the option of a union government based around those RECs or countries that are willing to join, while surrounded by a confederation of others that may initially not be willing to join the union. In this way, any state or REC that wishes to join the core group of the union government will be able to do so. The sole precondition for joining should be a willingness to help press ahead with the political project. Overall, there is no doubt that pan-Africanist solidarity can strengthen Africa. The problem is that the crisis of the post-independent African state and the ascendancy of nationalist feelings have largely worked against the optimism of translating the pan-African project into reality. While the AU celebrates this week under the theme ‘Pan-Africanism and the African Renaissance’, African leaders need to boldly create a more responsive model of unity for all citizens to follow. They need to pluck up the courage to introduce concrete procedures that can unite the African people, as well as states. This is a cross-post from ISS Africa. Emmanuel Kisiangani, Senior Researcher, Conflict Prevention and Risk Analysis Division, ISS Nairobi. African Security in 2013: A Year of Disequilibrium?